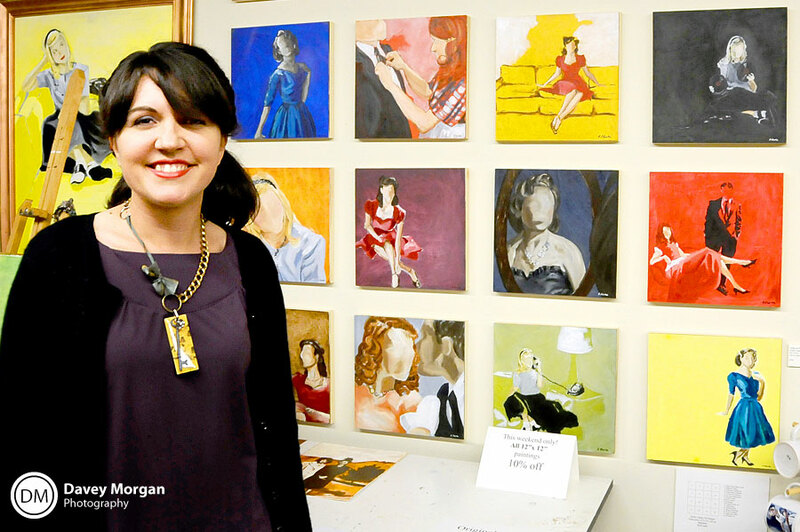 The Metropolitan Arts Council held Open Studios this past weekend! Marissa and I went to a few studios Friday night. We mainly went to the studios at Art Crossing! There are some amazing artists down there! These first artists are Cat (pictured) and Guy Stevens. I love this painting! Can you spot the polar bear? 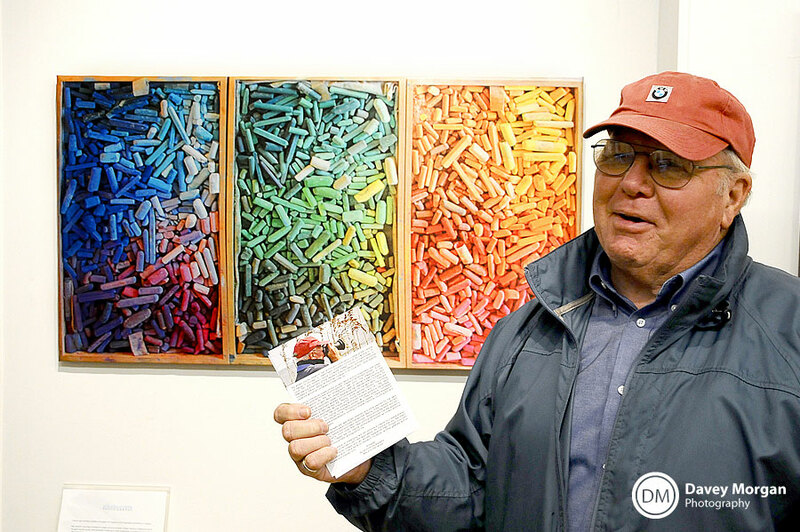 Guy has traveled all over, including Bermuda and Munich, to draw inspiration! I love the dots that he puts in his paintings! I also love the multitude of colors! Guy’s wife, Cat, paints some great art also! Here is where the master creates the art! It was very fun to talk with Cat and learn some of the figures in his paintings are actually his children! One featured a man in a black suit with a gun, we learned this was because his son loved “Men in Black” and would dress up for his dad to paint him! The second artist we visited was Larry Seymour. 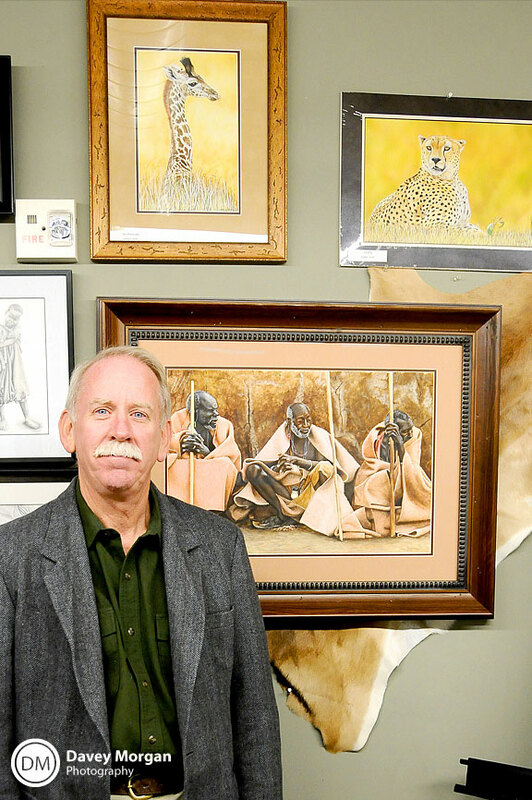 From a few trips to Africa, Larry has taken some photos of wildlife he has encountered, mainly in Kenya. From those, he creates photo realistic art with watercolors and graphite. Al Keiser is a photographer who “prints” his artwork onto satin! 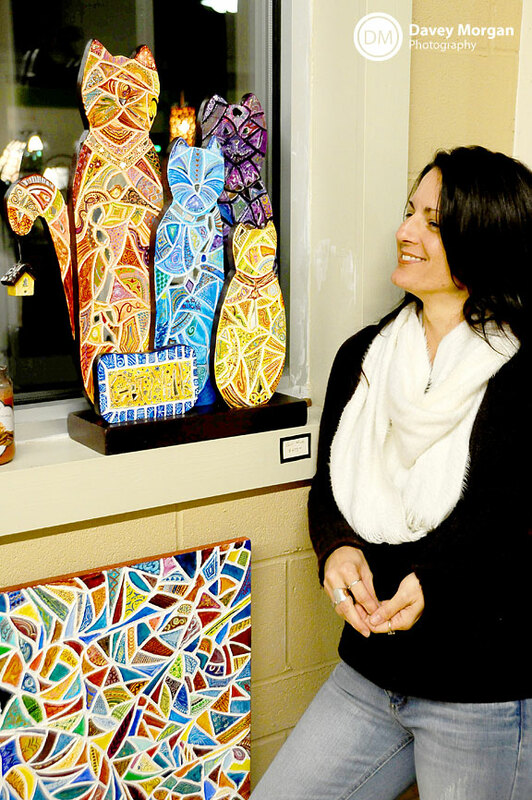 When you walk in the studio and view the artwork, there is a brilliant glow and shimmer from each piece. You can see him here in his signature jacket and cap! Who doesn’t love Emily Clarke‘s vintage oil paintings! They are so vibrant with color yet still so classic and unforgettable! We really enjoyed talking with her, and we learned that she hates a white canvas! She said she never starts with a white canvas if she can help it. She’ll paint the whole thing blue, or cover it in brown paper, I think it gives her work a very unique, and often colorful look! 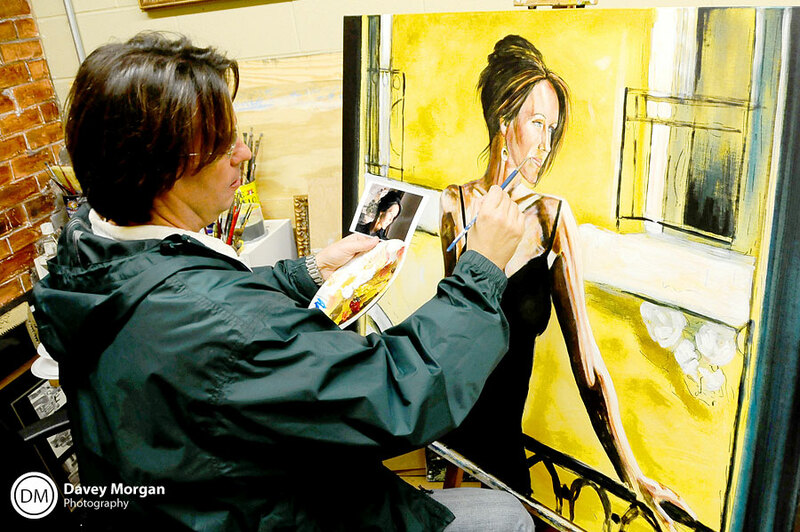 August Vernon of Studio 112, is seen here painting a piece for the Vision Fall Fashion Show. So he started it in the morning and is almost done! That is fast! 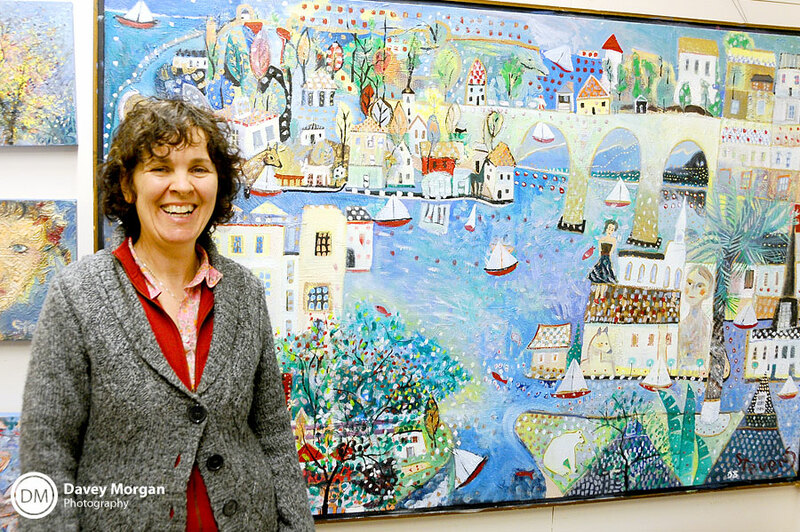 August’s wife Suzanne Vernon, also works with him creating out of the world mosaics! She designs all of the patterns you see on her work herself! Marissa and I loved this piece with the cats! 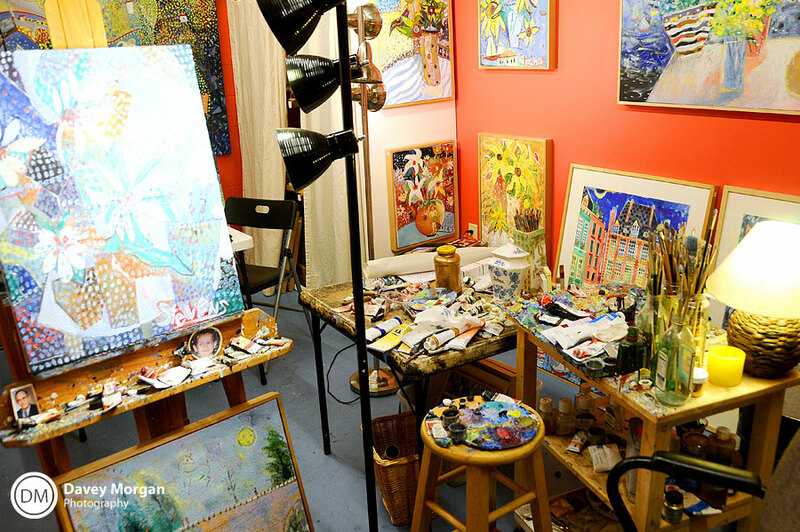 I would highly recommend to any art lover or anyone looking for something fun to do, to check out these studios at Art Crossing, downtown Greenville, SC. They are located right below Starbucks along Reedy River. This entry was posted on Tuesday, November 10th, 2009 at 2:48 pm	and is filed under Fun. You can follow any responses to this entry through the RSS 2.0 feed. Both comments and pings are currently closed. Davey, these pictures are awesome! I am so sad that John and I could come with you because I love stuff like this. Thank you for inviting us though! Hopefully we can make it next time! See you soon!